Probably the single most exciting wreck I have dived in NSW is the wreck of the SS Catterthun which is located off Seal Rocks just north of Port Stephens. On my first dive here I dropped the 60 metres onto the wreck and was astounded to see almost the whole wreck laid out in front of me. The visibility of 35 metres meant that nearly every inch of the 92 metre long vessel was visible from where our anchor was caught near the engine. What an introduction to a wreck! The SS Catterthun was launched in April 1881 from the Sunderland shipyards of W. Doxford and Sons for the Eastern and Australian Steamship Company. The new iron-hulled vessel displaced 2179 tons gross and was 92 metres long with a beam of 11 metres. Twin boilers supplied steam to a two cylinder engine of 250hp. This was a big ship for its day. The Catterthun departed Sunderland on 26 May 1881 and arrived at Port Said, Egypt, on 10 June 1881. She departed the Suez Canal on 12 June and arrived in Singapore on 2 July. She left Singapore on 5 July and when 80 miles from Hong Kong, she encountered the barque, Fabius, which was taking water. She towed the ailing vessel into Hong Kong arriving 12 July 1881. She off-loaded coal and departed for Foochow in China on 18 July, arriving on 20 July. A load of 2,500 tons of tea was taken on board and she left on 27 July. She passed New Guinea on 6 August and arrived off Cape Moreton (off Brisbane) at 10 pm on 13 August 1881. On 18 August 1881 the SS Catterthun arrived in Sydney Harbour. They had fine weather for the whole trip. As well as carrying cargo, the vessel was fitted out for carrying up to 38 passengers. The Catterthun entered into service on the Australia/China run, usually carrying tea to Australia and gold and other cargo for Hong Kong. On Sunday 3 December 1882, the SS Catterthun left Cooktown for Townsville and left there on Monday 4 December 1882 for "southern" ports. At 9:30 pm on Tuesday 14 August 1883, SS Catterthun left the Eastern and Australian Steamsship Company's wharf under the command of Captain Binstead. On board was a cargo of about 1300 tons coal, £6669 of gold, miscellaneous goods, nine European and 44 Chinese passengers. Captain Binstead later reported that he passed through the West Channel at 10:10 pm and then stopped the engines, having received instructions from his agents to the effect that he would there receive from the Health Officer two Chinese passengers who were said to be sick. The repeated sounding of the whistle did bring Dr. Sibley, the assistant Health Officer, with the Chinese passengers to the ship. Instead, the pilot boat ame and informed Captain Binstead that the Doctor's boat was in Watsons Bay. The Catterthun was then taken through the East Channel to Watsons Bay but the doctor was not seen. The ship was turned into the harbour again and the whistle blown furiously. Whilst waiting off Watsons Bay and when the ship had no way on her, the tide caught her bow and took her in towards Green Point. As Captain Binstead saw she was getting rather close to the shore, he gave the order for the engines to be sent fall speed astern. This was immediately obeyed but before she could gather stern way, she struck on the reef (Langs Reef) and her bow canted in. She was sitting on the rocks for about 6 to 9 metres with her stern in deep water. It was now about midnight. The engines were kept going full speed astern for some time, but without having the desired effect. No water was found in the hold but the forepeak was letting the water in freely. The pumps were handling it. An anchor was then put out astern, and at 6 am another attempt was made to get her off but it was unsuccessful also. Messrs. Gibbs, Bright and Company, the agents for the ship, despatched a hulk and the Port Jackson Company's, steam tug Commodore, which reached Watsons Bay at about noon. A gang of about 16 stevedores assisted by the crew, set to work to lighten the coal. By 4 pm they had removed 60 tons from the forehold which had the effect of lightening the ship forward to such an extent that the Commodore had no difficulty in towing her off. The Catterthun then steamed back to the company's wharf where she was examined by a diver who found that the stem was broken. The forepeak was separated from the other part of the ship by a watertight bulkhead. This was fortunate as there was almost six metres of water in it. The damage done was such that all the cargo had to be removed and the ship drydocked. It was estimated that it would take at least 10 or 12 days to repair. On Saturday 2 May 1885 passengers on the Catterthun played a cricket match against Port Darwin Cricket Club (Palmerston). The Catterthun was "detained" in Darwin and their team batted first and could only get 54 runs. In reply Palmerston scored 83 runs. The Catterthun arrived in Cooktown under the command of Captain Darke on Tuesday 25 May 1886 from Hong Kong via Darwin and Thursday Island. She left for the south later in the day. On 9 June 1886 the Catterthun departed Adelaide for Cambridge Gulf. This is in Western Australia near the border with the Northern Territory and Wyndham is the major town. On 21 June she left Melbourne and it was said that she was also going to Kings Sound. This is also in Western Australia and I presume that it was going to Derby. It says that there was a gold rush in the area and it was taking passengers and goods (including horses and drays). After Kings Sound it was returning to Darwin and then going to Hong Kong. On Tuesday 14 June 1887 passengers on the Catterthun played another cricket match against Port Darwin Cricket Club (Palmerston). Palmerston batted first and scored 99. The Catterthun team could only get 71 runs. On 9 April 1888 in the Sydney Police Court, two Chinese Ah War and Ah Woon and a Malay, Batil, were charged with smuggling seven tins of opium. The opium was said to have been obtained from the Catterthun. The charge against Batil was withdrawn and on 10 April Ah War and Ah Woon were convicted. Senior Magistrate T. K. Pater, fined them £28, about three times the value of the opium. On 29 April 1888 20 Chinese passengers on the Catterthun were refused entry into Sydney as they had "false" exemption permits that they obtained in Hong Kong. It was said that they would have to pay a poll tax. In The Brisbane Courier of 26 March 1894, Dr Walter E. Roth, the former Science Master of Brisbane Grammar School, wrote an article about his voyage from Sydney to China and Japan. He reported the sailors were all Chinese, the stewards Mongols and the firemen ex-slave negroes from Zanzibar and East Indians (Indonesians). He reported that the majority of the Chinese smoked opium. On 23 April 1890 in Darwin, some passengers of the Catterthun wrote a letter to Captain J. W. Darke, expressing their surprised satisfaction with the running of the ship on their two week voyage. The Catterthun operated without real incident for almost 12 years. On 31 July 1895 the ship left Sydney and steamed down to Port Kembla to load coal for her boiler. She returned to Sydney on 2 August and loaded passengers and cargo. Of interest were the 8,915 gold sovereigns contained in 10 boxes which were loaded in a large iron tank known as a specie chamber. Access to the tank was through a small manhole in the chartroom floor. 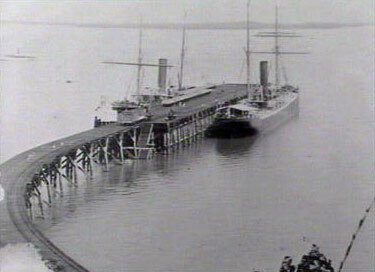 At 4.30pm on 7 August 1895, the SS Catterthun left Sydney Harbour for the last time on her way to Hong Kong. There were seven European passengers on the trip, the remaining being Chinese on their way home from the Australian goldfields. There was a south-westerly gale blowing and the seas were big enough for waves to come over the deck. The conditions got worse and by three hours after sunset the there was a almost fully fledged gale hitting the Catterthun. At thirty minutes past midnight on 8 August 1895, the vessel was off Port Stephens Lighthouse and heading N 30 E. The conditions were still getting worse, with rain and extremely strong winds. By 2am the Catterthun was six miles south of Sugarloaf Point Lighthouse (at Seal Rocks) and the crew on the bridge became concerned about the closeness of the shore. Captain Neil Shannon was consulted (he was in the chartroom) and it was agreed to alter course to N 40 E. Within a short time breakers were seen ahead (Big Seal Rock) and the Second Officer, Alfred Lanfear, ordered a change to N 80 E which unfortunately was straight towards Little Seal Rock. It was not until the vessel was almost right on the reef off Little Seal Rock that it was seen but it was too late. At 2.25am the SS Catterthun hit the reef at full speed (about 11 knots) and carried on until it hit again eight seconds later. It still continued and was now past the reef but her days were numbered. These reefs were probably Little Seal Rocks and/or some reef nearby. Most of the sleeping crew and passengers were awoken by the two impacts and were soon up but many went back to bed after finding nothing awry. Meanwhile, the crew examined below deck and found the forepeak and number four hold almost full of water. The Captain ordered that the lifeboats be prepared for launching but the passengers had not yet been informed of the impending problem. Very soon the ship was listing to starboard and the boat was becoming difficult to handle. The Captain decided to try to beach the ship in Seal Rocks Bay and the course was altered to almost due west. By now there was a foot of water in the cabins on the Saloon Deck and only ten minutes had passed from the first impact. The Captain and two others were washed off the bridge by a wave and one of them, Joshua Fawkes (a Torres Strait Pilot), watched as the ship powered on without anyone in control. Some lifeboats were launched and just 20 minutes after hitting the reef (at 2.45am), the Catterthun went down. One boat had 26 people in it and after considerable rowing, they came across a small sailing boat, the Olga, anchored south of Charlotte Head. The small vessel then towed the lifeboat to Foster and arrived there at 11am. After taking the two vessels over the bar, the tug Marion Mayfield headed towards the wreck site but had to turn back because of the seas. The next morning she attempted again as did the tug Gamecock which left Newcastle. The Gamecock did not find anything but the Marion Mayfield found one lifeboat with a dead Chinese in it and two more crew. A total of 55 people died in the accident. A Coroner's Inquest into the three bodies was held at Foster on 12 August 1895. 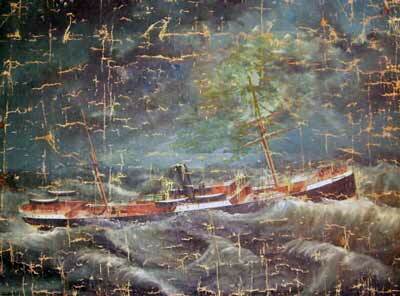 On 19 August 1895 the Stirling departed Sydney to search for the Catterthun so that salvage could be attempted. Captain John Hall from Sydney Underwriters Association, was in charge of the vessel. On 23 August they found the wreck (in itself an amazing feat as the wreck is a considerable distance off the shore) and the next afternoon a diver was sent down to confirm that what had been found was the wreck. 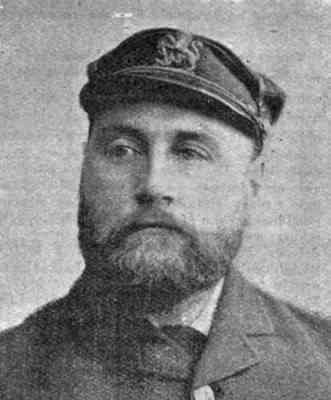 Arthur Briggs, the expert salvage diver who had salvaged the SS Centennial and SS Duckenfield in Sydney was brought in to do salvage on the wreck, especially the gold sovereigns. They salvaged about 7,900 leaving about 1,000 unfound. It is also possible that they were all salvaged and the 1,000 missing ones kept by the diver operation and not turned over. If I get the time, the story of the salvage will be provided in another article. I was told that in 1977 Rick Latimer was shown the location of the wreck by some fishers and he was the first person to dive it in the modern era. However, I have since learnt more about this and present the probable true story below. In the early 1960s it is possible that another hard hat salvage operation was conducted with the aim of recovering the remaining sovereigns. This is based on claims made by a fisher at Seal Rocks to Chris Reilly in 1969 (see following paragraphs). From 1966 to 1968 Chris Reilly was President of the University of New South Wales Underwater Club. To fund his university studies, Chris and Richard Arthur (fellow member of the UNSW Underwater Club) started a mooring and salvage business, ARGO Underwater Services. In 1969 Chris was picked to do Australia's first computer science honours course at Sydney University with the promise of a job after that in Melbourne. This meant the end of the salvage and mooring business. They decided to liquidate the business and use the funds to attempt to find the wreck of the Catterthun and salvage the remaining gold sovereigns. They went to the NSW Mitchell Library and got copies of all the old newspapers and tried to work out where the ship sank. They headed up to Seal Rocks. On the trip was Chris, Richard Newton (a recently arrived New Zealander) and Richard Arthur. They set off with a bank of 220 cubic foot cylinders on a trailer and a lot of French aluminium tanks. Chris had organised a deal to turn French aluminium fire extinguishers into scuba tanks by getting valves made for them locally. They could not afford a portable air compressor and the nearest one was in Newcastle. They also had ARGO's 15 foot runabout. When they went to look for the wreck, they saw an old fisherman literally living on the beach in what looked more like a dwelling made from fence palings than a shack. 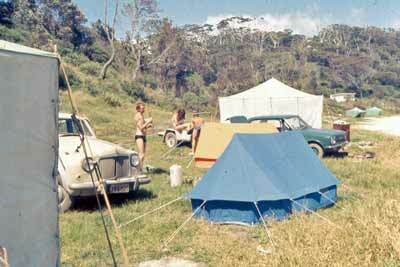 Seal Rocks was a squatter's paradise. He told them about a hard hat operation which had taken place many years ago (1960s they seem to think) and told them of a bearing from the local post office/general store that would find the wreck. Chris thinks that the bearing lined up with a "white tipped rock". They launched the runabout across the beach on rollers. On day two they hooked something with a grapple. When Chris went down the rope he found they had hooked the stern> They saw the external wheel which was directly connected to the rudder mechanism, backing up the one in the wheelhouse. See the photograph below right. They were astonded by the size of the engine which Chris said was "the size of a bus!" All the wood of the wheelhouse had gone. Of course, they were looking for the safe which was in the floor, but bolted onto the frame of the ship. The original salvage team had got it open but could not detach it from the ship. They rigged a rope and drum which floated to within 30 feet of the surface (when the current was not running too fast) and there was a small float hanging off that. They even made a special tool to extract the coins from the safe. It was assumed the wooden boxes had rotted away. Of course, they did not find any sovereigns. They came to the conclusion that the early 1960s hard hat operation had cleaned up most of the sovereigns. Chris said that there were rumours of them being sold around the pubs in Foster. Certainly someone had got some of most of what was left by 1969. Chris says that given the accuracy of the beach dwelling fisherman's location information, he was prepared to accept his hard hat story too. They eventually ran out of time as they could only do one dive a day in the morning before the wind came up. They only did 10 minutes bottom time (on a single tank) and it was very weather dependent. Chris went off to Melbourne and then Minneapolis. They never made it public that they dived the Catterthun as around this time a diver died on the SS Birchgrove Park and they were worried that the authorities would regulate wreck diving. The less they knew about the diving going on the better. In 2010 I found an article from the December 1978 issue of S.I.A. (Spearfishing in Australia?) by Barry Streete. This article says that in about June 1977 a group of Newcastle divers (Barry Streete, Tom Brennan, Brian Parker, John Rutherford, John Fitter and Steve Ward) decided to commence a search for the wreck of the Catterthun. They did 12 months of reasearch, consulting old newspapers in the National Library in Canberra. 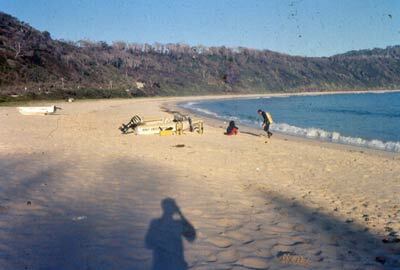 In about mid-1978 they set out from Port Stephens (I think). After three hours of searching using compass and depth sounder they located the wreck. There was a current of five knots running (probably not that strong) so they decided to come back the next weekend. On that day Streete, Fitter and Brennan descended first. They were hooked into the Catterthun's anchor chain. They found numerous artefacts on that first dive, including beer and soda bottles, brass fittings and more. 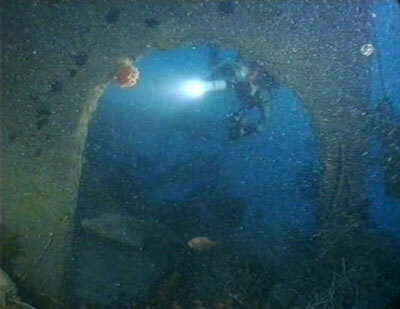 Therefore, although I have been told that Rick Latimer was the first to dive the wreck, this is probably not correct. The first recreational divers to dive it (even though they were attempting to do salvage work) were Chris Riley and his friends, then probably Barry Streete and his friends and then perhaps Rick Latimer, although Rick may have been there the year before Barry. I doubt we will ever know the complete truth. In 1985 a group was put together by David Molesworth (not sure who he was) with the aim to salvage gold sovereigns and artefacts from the wreck. This project was called Going for the Gold. Molesworth said that there were approximately 2,000 sovereigns remaining on the wreck valued at about $300,000 at that time (however it was more like 900 to 1,000). The plan was also to make a documentary for television and articles for quality magazines. Members of the group were Paul Rosman (then or later a dive shop owner - Divemaster/Safety), John Riley (Archaeology/Recovery), Kevin Deacon (dive shop owner and photographer - Cinematography), Kevin Laybutt, Neil Manns, Alan Brombie, Bruce Schultz, Norm Needham, David Suttie, Les Rochester, Graham Costello, Andrew Frazier, Steve Barnes, Don Rosenfeldt and Rory McMahon. I do not yet have a full report of what happened to this project, but I do have some information. In 1986 they spent 10 days at the Catterthun. They shifted coal by hand but did not even find one sovereign. Later, Rory McMahon was charged with stealing gold sovereigns and perhaps other items from the wreck as it was now owned by P & O. He was found guilty (I think) but this was later dismissed by the appeals court. Today, the wreck of the SS Catterthun lies at a maximum of 60 metres pointing towards the safety of the shore. Unfortunately the wreck is located in a position where it is often subject to strong currents. As if this is not bad enough, the site is very open to southerly and south-westerly winds. See GPS and Marks Page for more details. I have now dived this wreck five times but on two dives on the wreck on the one weekend (my first two dives), the conditions varied from 35 metres on the Saturday to less than four metres on Sunday while sea, current and wind conditions remained identical. Despite this change, the second dive was still extremely exciting and thrilling. The wreck lies upright and fairly intact. As I indicated in the opening to this article, my first dive started at the engine and we headed forward. 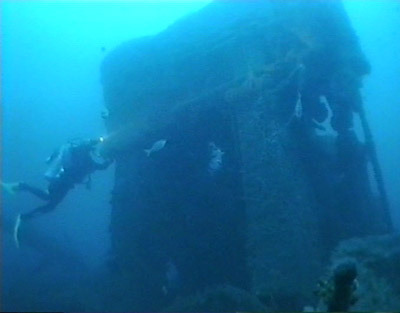 The huge engine juts up four or five metres off the rest of the wreck and immediately in front there are the twin boilers, the starboard one with another tank on top and a donkey boiler further to starboard. Going towards the bow you pass over the refrigerator and then the refrigerated cargo hold. The specie room (where the gold was stored) is between the boiler and the refrigerator but there is no evidence of it remaining. Past the hold there is a flatter area with coal and winches. The immediate bow of the ship is broken off from the rest of the wreck and has fallen on its starboard side. As you approach it there are numerous bones. They are not human but horse shanks being carried as cargo. 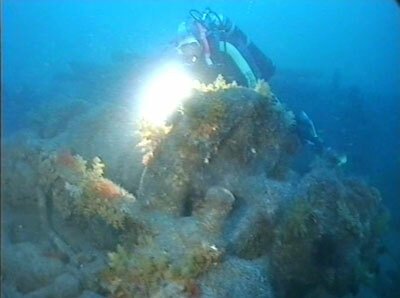 Some of these can be found back on the main part of the wreck and more on the left side as you approach the bow. 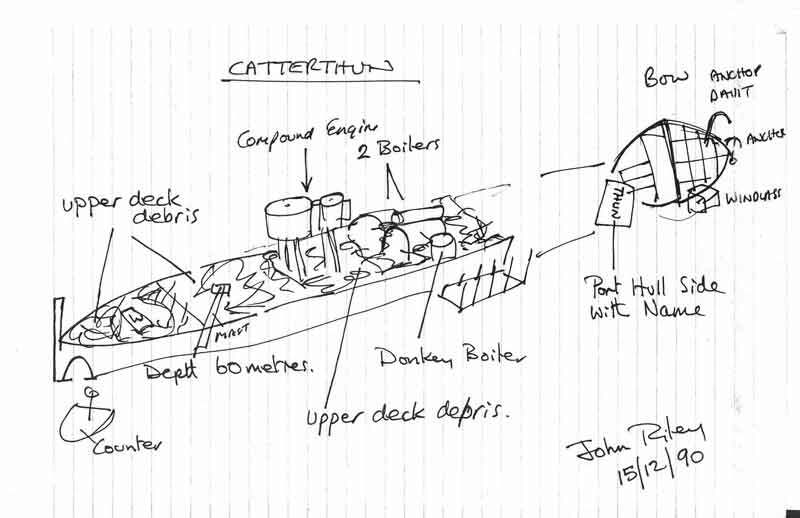 Part of the Catterthun's name can be seen on the bow (HUN) and the Chinese crew's quarters can be entered. A huge pile of anchor chain can be found in the lower part of the bow. A friend of mine has found a sovereign on the wreck and also found a gold watch previously owned by William Loring and being carried by his widow and daughter when they were on their way home to England after visiting relatives in Melbourne. Both Mrs and Miss Loring died in the sinking. Another Sydney diver found another watch (not gold unfortunately) in more recent times. I also found a beautiful torpedo soda bottle. There is a photo of this above. On a dive here in 1995 with Rick Latimer, Rick found a beautifully coloured coffee mug. However, he ended up breaking it as he attempted to get it free when we had to make a fairly rapid departure from the wreck as our anchor had come free from the wreck and disappeared off across the sand. This is a huge wreck, and even after doing five dives I have not yet seen but a small percentage the wreck has to offer. 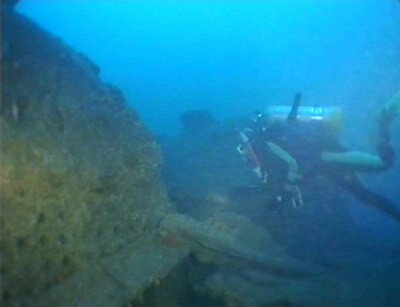 The stern area is fairly intact but the prop is not visible although the rudder can be seen. A large winch sits just behind the engine and you can see into some of the compartments in this area. The bottom of the wreck at the stern is just over 60 metres, the sand on the starboard side of the wreck is 59 metres (it is a metre or two shallower on the port side) and the main part of the wreck is 56 to 57 metres deep. A bottom time of 22 minutes on the wreck (and 19 in the deeper sections) means that you have to do decompression of 3 minutes at 12 metres, 6 minutes at nine metres, 14 minutes at six metres and a massive 31 minutes at three metres. With a five minute safety margin, you must do a huge 59 minutes decompression or even more. Of course, this is a dive only for the very experienced and properly equipped. Not only do you need twin tanks (88 cf at least), you need spare air, oxygen, proper deco bars, safety sausages, reels etc etc. As an extra to the thrill of the wreck, divers often encounter sharks on this dive. On my first dive here we saw three or four bronze whalers swim past us as we ascended the anchor line. Friends on another boat only 50 metres away at the same time were hassled by more than 30 sharks. They ended up leaving the water before their indicated deco time was up they were so threatened by the swarming sharks. The wreck itself is covered in some of the most colourful growth that you will ever see. The soft corals almost glow in the reds, greens, yellows and purples that are lit up by your torch. This dive can be difficult to do as no charter boats regularly visit the wreck. In most cases you will need to use your own boat although I believe that at least one of the Forster dive shops will take experienced divers to the wreck. In summary, the most exciting dive in NSW, if not Australia, as well as being just behind the best two dives I have ever done (100 hammerhead sharks and the USS Aaron Ward). All underwater photos from Hi-8 video.